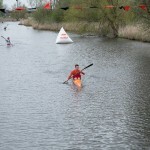 The 44th edition proved to be one of the toughest editions in the last five years. 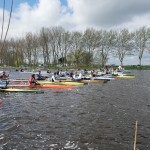 Where mild temperatures and sunshine favored the late editions, this edition took place in less favorable conditions of strong winds and the occassional rainshower. 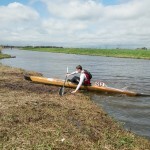 This provided all competitors with another challenge apart from surviving the mass starts and the challenging race course. 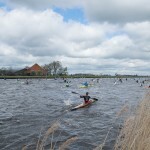 Many athletes took unforunate swims in the chilly conditions, all finished safe and some even managed to finish in top rankings despite swimming. 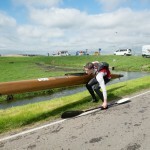 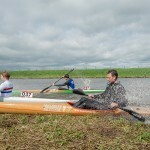 With a start of 104 paddlers the first obstacle after surviving the start for the masters and senior men would be to survive the narrow section exactly one kilometer after the start line. 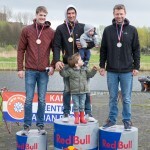 This obstacle was taken best by the top favorites Adrián Boros, Emilio Merchan, Alejandro Sanchez, Joep van Bakel and Dries Corrijn forming the strongest elements of a large lead pack. 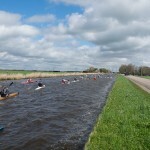 In the narrow channel leading trough the Dutch waterlands, it was these top favorites setting the racing pace on to the first portage. 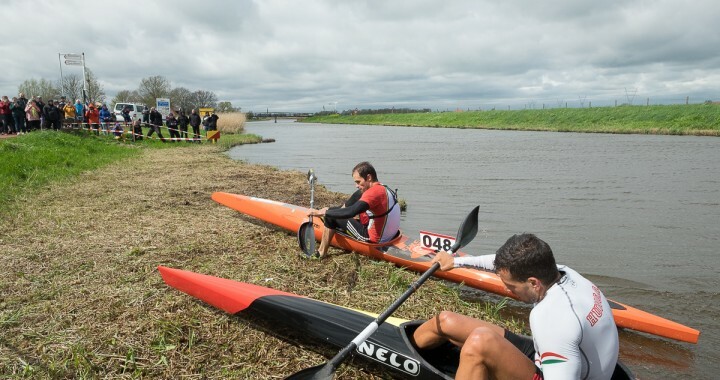 On this portage Adrián Boros and José Leonel Ramalho managed to escape from the rest of the field, as some of the chasers like Emilio Merchan took unlucky swims at this portage. 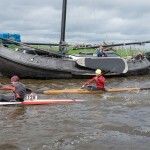 It was the second portage where José Leonel Ramalho managed to escape from Adrián Boros leading the race all the way from the second portage to the finish line. 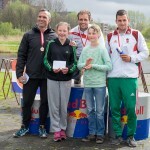 Adrián Boros took home the second place and Emilio Merchan Alonso finished in third place despite his unlucky swim. 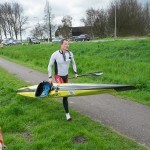 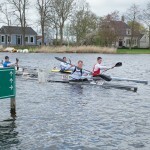 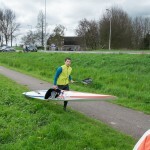 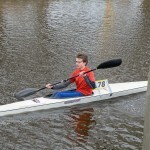 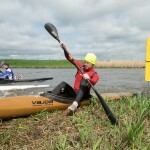 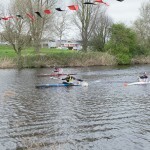 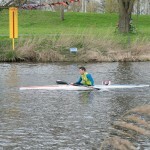 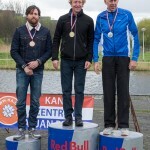 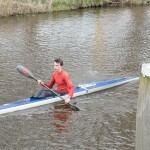 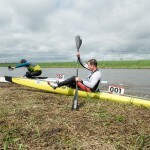 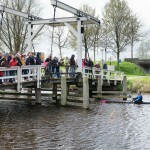 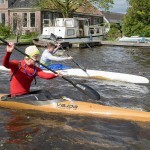 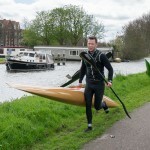 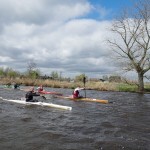 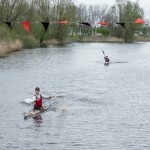 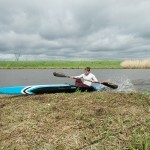 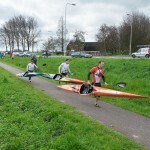 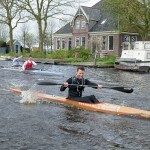 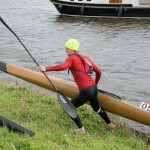 At the masters men race the first place was taken by Torben Thomson form Denmark followed by the two Belgian paddlers Aleksandr Soloid and Erik Verduyckt. 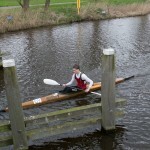 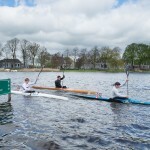 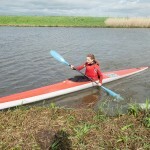 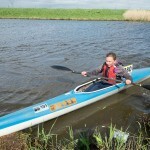 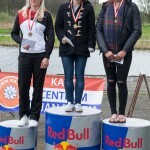 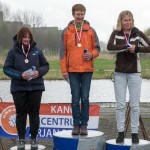 At the masters women event the top rankings were taken by Dutch paddlers Esther van Lohuizen and Elly Onnekes in first and second and in third place Sabine Goossens. 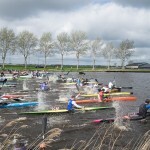 With 71 paddlers , all women and junior men had a challenge of their own to deal with, not only was this the largest mass start ever on the 14 kilometer course, the start also took place in one of the most choppy, strongly wind-blown sections of the course. 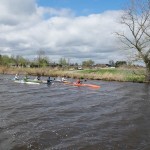 The ladies and junior men had to fight these strong headwinds on all sections of the coming race, making it an extra tough race for all 71 that started. 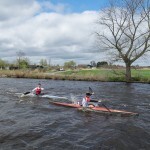 Top favorite at the senior ladies Richmond Canoe Club paddler Lizzie Broughton, did not dissapoint in these challenging conditions. 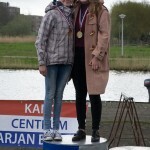 She sovereignly took home her third win in a row at the Amsterdam Waterland Marathon. 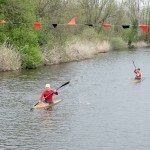 Lucy Lee Smith (second) and Jennifer Klein finished four minutes after Lizzie. 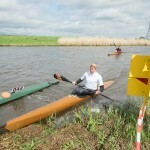 We wonder if Lizzie will keep up this winning spree until our 50th edition. 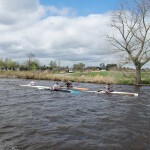 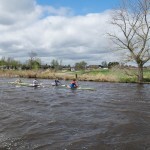 At the juniors race it was the British national squad taking home the top rankings at both the men and women, followed by an Belgian kayaker in third place. 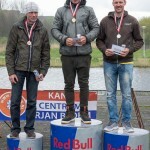 At the men it was Cristopher Carson in first, Joe Petersen in second followed by ) Nick Verduyckt in the third place. 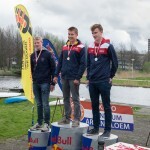 The top four paddlers in the junior men all finished within seconds of eachother, demonstrating the high level of competition for the junior men. 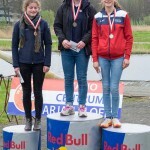 At the womens junior race Emma Russel took the highest place and Freya Peters the second place, with Roos Broekx finishing in the third place. 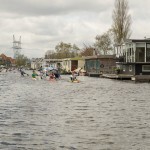 We look back at a tough but sportive 44th edition of the Amsterdam Waterland Marathon where hard earned points of the ICF classic series have been divided. 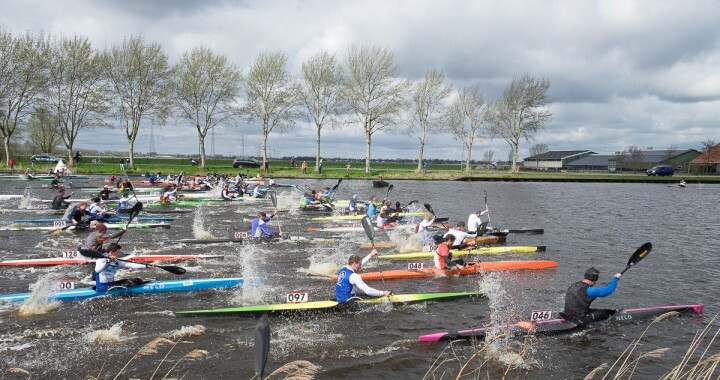 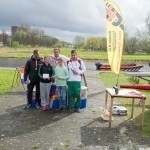 Kayak club Viking Amsterdam is very proud to organise this growing one of a kind event, we would like to thank all the participants, volunteers and our sponsors for their royal contributions. 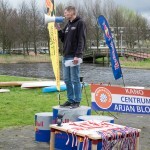 Big thanks to our main sponsors Funderingstechnieken “De Coogh”, Kano Centrum Arjan Bloem and our event suppliers Nelo Kayaks and Red Bull for their energy. 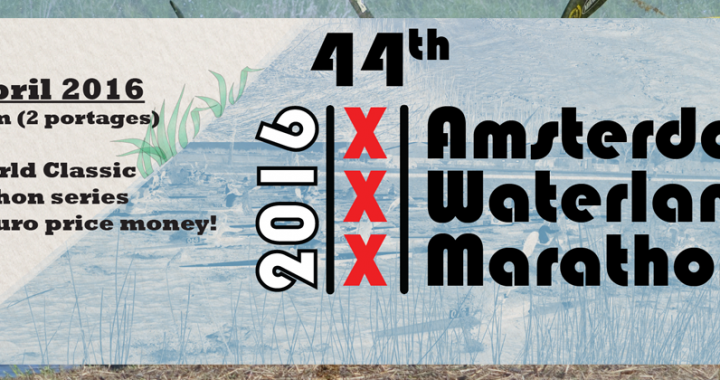 We hope to see all of you again at the 45th edition!